Green World Group, founded in 2005, is a Middle East based organization providing services on Health, Safety & Quality consultancy & Training, Recruitment & Selection of highly qualified/experienced manpower. Our team of health and safety professionals have expertise in specialist training courses, designed principally keeping in mind the current trends in skill development and training. They have experience and a proven-track record in delivering practical and relevant solutions that cater to the global audience. With quality as the focus of our training provision, GWG provides eminent training facilities to our students and clients, making sure they understand every significant business function. Our training portfolio includes training on Health and Safety, Occupational Health, Environmental Management, People development, HR and employment law for managers, leadership and Management and other business-critical elements. We also provide certification courses like Nebosh International General Certificate, NEBOSH International Technical Certificate in Oil and Gas Operational Safety, IOSH and HABC. The team of experts at Green World Group includes resourceful problem solvers and innovation-driven minds from diversified backgrounds who understand the needs of students and provide them hands-on experience on latest tools and technologies with the help of workshops, apprentice training, on-line revision planners, business improvement to engineer skills and crisp and brief publications. The course and publications’ content is tailored to the business specific goals of any organization. 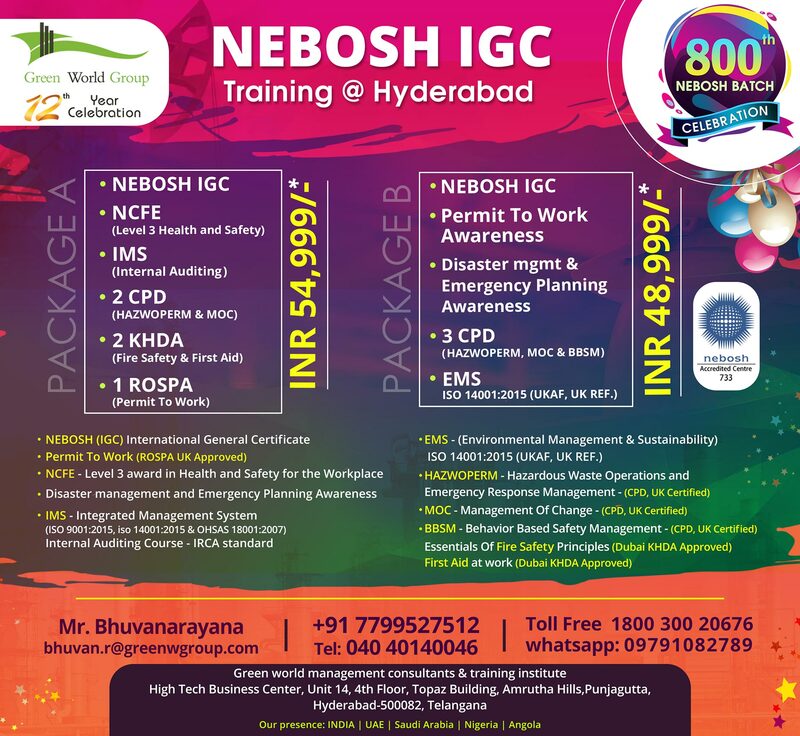 Nebosh in hyderabad, owing to our most contemporary training techniques and dedication to optimization of skills, GWG helps customers or students to identify the market requirements and areas of requirement. The apposite guidance received by our experts helps customers streamline the business processes and deliver superior customer service.